SUPER RAD RAYGUN pits Rad against a whole new wave of deadly enemies and locations – from the Communist strongholds of the Far East to strategically insignificant islands off the South American coast. But chill out, because Rad has gnarly new weapons, upgrades, and a revamped gameplay engine to help him out. Ultra sharp 144p resolution graphics and 4 unique shades of monochrome off-green bring Rad Raygun to life, as only 80′s mobile technology can. Super Rad Raygun is a nod to video games and pop culture of the 1980s and pokes fun at the politics of that era. It is a trip down memory lane for retro enthusiasts, while also incorporating modern systems and play mechanics familiar to today’s gamer. 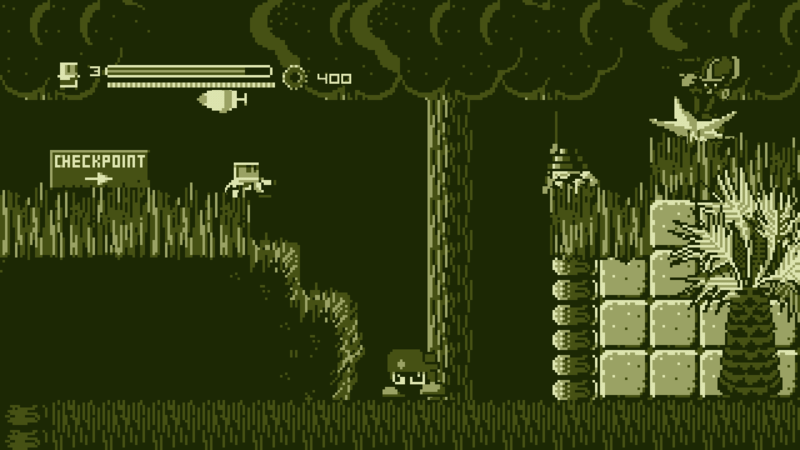 Super Rad Raygun is a follow-up to the Xbox Live Indie Game, Rad Raygun. Led by Ronald Reagan and Dr. Yokoi (Dr. Y), Rad Raygun must save the 1980s from communist robots! While the original Rad Raygun had only five levels and limited upgrades, Super Rad Raygun includes over twenty levels, 3 modes of play, a new upgrade system, and a limited-energy mechanic. As a play portable gaming’s limited battery life, Super Rad has a limited amount of energy to perform certain abilities, such as jumping, shooting, and dashing. When Rad depletes his energy, he must rest for a few seconds. Throughout the game, Rad collects “bits” — these are a form a currency used to buy upgrades from Dr. Y. As Rad becomes more and more powerful, he consumes more and more energy, but thankfully Rad can upgrade his battery life (amount of energy) and his agility (time it takes to recover). 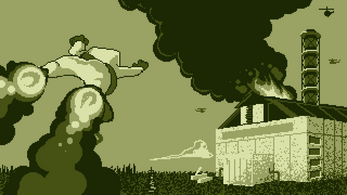 Thanks to itch.io, we're bringing you Super Rad Raygun DRM-free for the first time ever! This build does not require Steam and does not feature Achievements or Leaderboards. Just finished the game! Really enjoyed watching Rad grow over the course of the story. There's oodles of charm in the jokes, character designs, and all the tiny details. I can tell you put a lot of work into this. Sorry to hear about the saving issues that you ran into. We'll do some digging and try to reproduce it on our end. I was using the downloaded Itch.io version. I booted up the game to play through some older levels to get enough bits for upgrades before before I tried to beat the second-to-last level. The first time I exited and continued, I suddenly had the same number of bits as when I'd continued from my last save file. Went "Argh! ", played through some more levels, then exited once more and had the same problem. It seemed to fix itself the third time around, when I decided to just grind enough to actually purchase the upgrades I wanted before exiting the game—the upgrades and number of bits were the same the next time I continued from my file. It's possible that the game just doesn't save your progress after you finish old levels? In which case, er, consider this general feedback on changing that. The game supports most USB gamepads. You can also configure the buttons and keys in the options menu. You give a steam key if i buy there? Yes, if you buy a copy of the game here on itch.io, it comes with a Steam key.